38 weeks pregnant, and summer has finally arrived in Sydney, it would seem. And here I thought we were going to escape the worst of it, due to the devastating floods in Queensland, and the subsequent rain and cooler weather. This week has seen temperatures far more normal for Sydney in summer, including a predicted (but not reached) 42 degrees Celsius for Australia Day, which was yesterday. We stayed indoors for the most part, with fans on, shutters down, amusing ourselves quietly. Even in the absence of airconditioning, and a pool, we stayed fairly comfortable in the 35 degrees C heat here. I haven't been doing much sewing, much as I would like to. In this heat, standing for more than 15 minutes has me feeling faint, so tracing out patterns, or cutting them out is a task in and of itself, in order to get to the sitting and sewing stage. 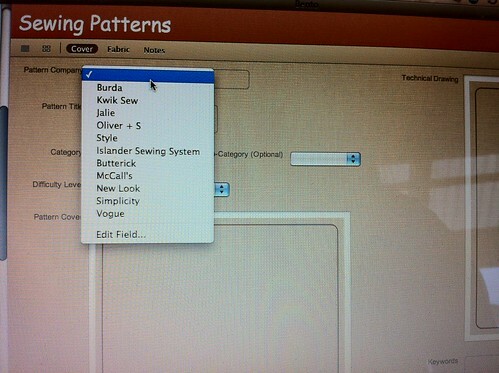 So I decided to do something sewing related while sitting; organising my pattern (and to come, fabric) stash on my Mac. Connie in Canada posted on PR in response to a question on stash organising software this post in December last year, and it was the first I heard of Bento 3 for Mac by Filemaker. Others on the PRDU regional thread raved about this software for organising their fabric and/ or pattern stash, and I was sold. My copy arrived from Amazon.com about 3 weeks ago, but I have been busy finishing 3 online courses on Sunnipath/Qibla in their global intensive, and so Bento had to wait. Now that I have been fiddling with it, I can't say it is the easiest software to work out, but maybe that is just me. 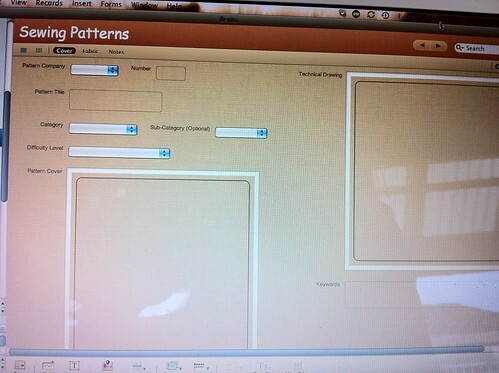 I had tremendous difficulty with it initially, and kept giving up and coming back to it, but a couple of days ago, I stumbled across Filemaker's "solutions" page, where they also have a template exchange and came across several free sewing related template, thereby saving me the hassle of making one myself, like Connie did. I have spent much of today transferring my patterns from iPhoto to the database in Bento, and while I have much work to do on it, I finally figured out how to modify the best of the templates, to suit my needs. It is not the most intuitive program, in my opinion, and I was almost set to throw it all in, when I finally figured it out, so I figured I may as well share, in case anyone is as ...computer challenged as I.
I have taken the pictures on my iPhone, so they could be better quality, sorry. I tried initially to make one from a blank template, as Connie did, but found it too much of a struggle, because it does not come with a manual/ instructions. It was not until I came across Bento Template Exchange and found several free sewing pattern templates using Bento for download, that I began to have some idea of my options. This is how the form came originally, with 3 "pages", the first for the pattern itself, with options for entering Pattern Company, Pattern Number and an image of the Cover Photo/ Pattern as well as an image of the back/ technical drawing. Page 2 allows you to enter fabric details, namely yardage and notions. And Page 3, allows you to make notes on modifications and any points of note when the project is completed. The template maker also has sub-divided the patterns into collections/ categories, such as "Misses' Tops" "Children's Clothes" etc, which I initially found useful for classification purposes. Like I said, most comprehensive of the templates I downloaded, and I began to fill the template with my Kwik Sew patterns and my Jalie patterns, with what I could. I could not for the life of me determine how to add to the original form however. Yesterday, though, I finally figured it out. You ADD to the fields not by adding to the column on the left bottom, and then once your field is created, you can draaaaaaagg the whole field onto the template itself, and arrange size, placement etc as you like. I think this is a more economical use of space on the same form/ page. I also added a sub-category in case a particular pattern has more than one garment type on it (eg Misses' top and dress, or in the case of Jalie patterns, where the sizes go all the way from children/ toddler to adult plus sizes). Additionally, I also added a box for Pattern Description, and one for a URL so that I can link my completed project to my blog, or my review on Pattern Review for easy reference. I finally added a box for keywords for ease of searching for patterns. Their search box is pretty nifty; i.e type in Jalie, for example, and all Jalie records will come up, and you can choose what you are looking for on the basis of your search terms, which I think is also more intuitive than using the original categories that the template maker used. Finally, yet to be completed, on the second and third pages, I added some modifications as well, as yet WIPs. To the "Fabric" page, I added image boxes for the picture of actual fabric that I end up using, as well as a photo of the finished garment. And on the final page, for notes, I added boxes for dates of garment construction, for my own reference. My Page 1, or Form, entitled "Cover", modified from the original above, to these two above, with the changes I mentioned. 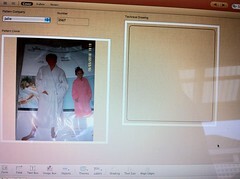 My Page 2, or "Fabric" form, with yardage, notions, and image boxes for fabric used and photo of finished garment. And finally, Page 3, "Notes" form, with final notes on construction, and any other relevant information. I also purchased the iPhone Bento app (AUD 5.99), since my 2 year old HTC phone died and Bento was the main reason I decided to go with the iPhone. So now with the Bento app for iPhone, I can sync my database on Bento with my iPhone, and have begun to have access to a database on my mobile of my pattern stash, to avoid duplicates when out shopping. Once I get the yardage photos from the back of the pattern covers loaded onto the templates, it will also mean that it will be an easy reference to look up how much of a fabric I need to buy for a given pattern, if I come across something suitable. Lastly, Bento is also great for many other applications, including organising family life, student life, tasks, calendar and more, so I think, now that I have finally managed to figure this out, I will get good mileage out of it, when time permits!! We're also going to put DD's school timetable on it this year (she's in Yr 11). Imaan, I admire your energy level given the recent heat wave and the proximity to your due date. I'd love if there were a similar version for androids. I'm thinking my next phone might have to be an iPhone!! Hello Imaan, this sounds very organised. I hope you will post when your new baby arrives. It is very hard work to be expecting when the weather is so hot. Your name came up for the Colette coat pattern. If you send your mail address to harube 95 at hotmail dot com (no spaces and use symbols) I will post the pattern off to you.